I'm a certified space junkie. Certified. Being an astronaut was the first thing I recall wanting to do. I don't recall ever being jealous of anyone or anything they had or had done except for two guys I met on separate occasions. Both were Flight Controllers for the Space Shuttle. Awesome! Anyway we took a trip down to Disney World recently and spent one day at Kennedy Space Center. I hadn't been there since 1974 or thereabouts (that's me below). There wasn't much. Some items from the Apollo, Gemini, and Mercury programs lying around in a field. It has changed quite a bit since then. It's a real attraction now run by a private company. The main center has a rocket garden with about 20 rockets assembled. The shuttle and main launch rockets are there and you can go inside. And you can also take a tour around the facilities. This is highly recommended. The tour takes you past the main buildings. You can see the administrative facilities including where the astronauts come out. They take you past the VAB, or Vehicle Assembly Building (the big iconic building). They take you past the crawler tracks and the Shuttle launch facilities (39A & 39B). And if you are lucky like we were there will be a Shuttle (Discovery) on the launchpad. Awesome. Plus alligators everywhere. Double rainbow! Finally they drop you off at a second center that houses the REALLY cool stuff. You have to go on tour for this. Inside is the full Saturn V rocket (friggin huge! ), the Apollo 14 command module, moon rock, actual space suits (e.g., Shephard's suit), and a ton of other stuff. I could have stayed for days. I learned a few things on the trip. The shuttle undergoes a "nod" or "twang" (in NASA parlance). About 6 seconds before the Solid Rocket Boosters (SRB) are lit the three main engines on the shuttle itself are lit. This sudden thrust is off the center of mass of the entire shuttle construct and thus produces a torque. This torque forces the shuttle to nose down because the entire construct is being bent. The displacement is about two meters and is quite noticeable if the camera is reasonably close. When it snaps back the SRBs are lit. You can see it clearly the movement in this video. If you keep an eye on where the tip is in relation to the clouds you can see it roll nose down and then when it comes back to center the SRBs are lit and it takes off. For the early shuttle missions the entire shuttle construct was all white. 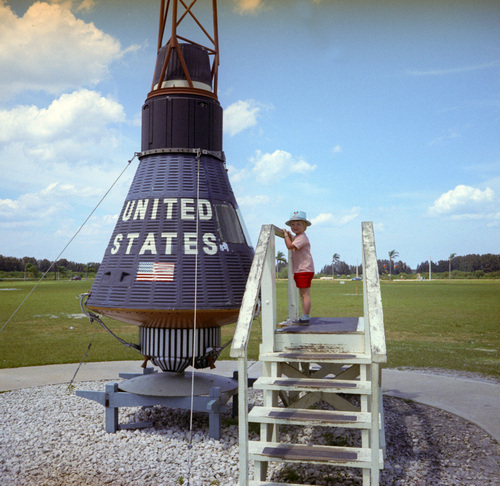 Later the main center fuel tank, known as the external tank, became orange. The reason for this is that NASA stopped painting it white to save 600 lbs of weight. It's orange to save weight. The space shuttle down-throttles the engines when it hits a spot in the atmosphere (about 35,000 ft) referred to as Max q. "q" is just the dynamic pressure on the hull and is a function of both air density and vehicle velocity (q = f(air density, speed). At launch the velocity is zero so the dynamic pressure is zero. In space the density is zero so the dynamic pressure is zero. Somewhere as the velocity increases and the density decreases q hits a maximum point. This down-throttling is to alleviate pressure differences on the external tank hull that would cause it to collapse. Less thrust means more internal pressure so it keeps "inflated". After passing this spot it thrusts back up. This is when the Columbia disintegrated. The reason the SRBs are recycled and the external tank isn't is because the SRBs come off first. The fall into the ocean near the launch site. The main tank is released much later and comes down in the Indian ocean. Too far away to collect and send back for processing. Also this is kind of obvious but the external tank (the orange part) is just that; a tank. There is no engine at the bottom. It feeds the 3 main engines on the shuttle. It's a disposable gas tank. The Saturn V rocket (the one used in the Apollo missions) used 5 F1 Engines in the first stage of launch. One F1 engine has more thrust than all 3 main engines on the space shuttle combined. It however has less thrust than the solid rocket boosters. Those things are propulsion beasts. Only downside is SRBs can't be turned off. The Saturn V rocket was tested only twice (Apollo 4 and Apollo 6, both unmanned) before a fully manned flight was made (Apollo 8). Apollo 6, the second test, the one before they put people in it, was filled with serious problems. Stage 1 had serious pogo oscillations and Stage 2 had 2 (of 5) main engines shutdown. All the spacesuits are disintegrating. The plastic parts are made from PVC softened by an agent. The agent seeps out and becomes brittle. At KSC Alan Shepard's suit is kept in a dark room to minimize decay. Eventually they will all disintegrate. There is no way to stop it. When the Space Shuttle takes off you can see sparks being sprayed under the three main engines on the shuttle. I always thought this was how they lit the fuel mixture. But it is actually to burn up any stray hydrogen or oxygen that may accumulate around the engine.